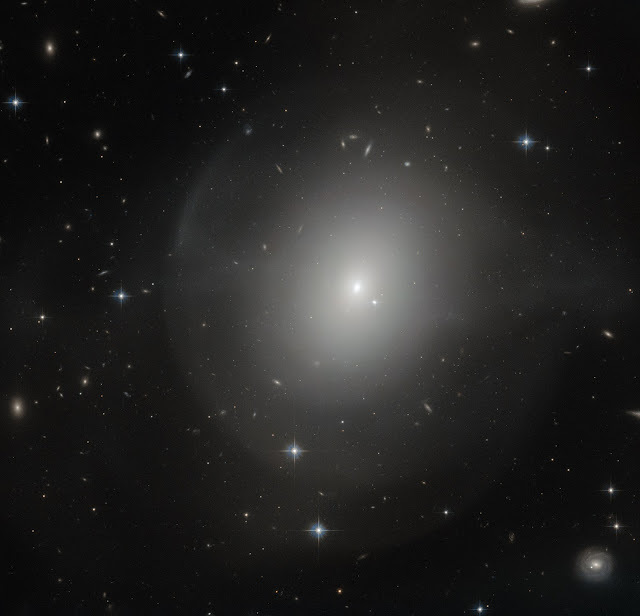 This NASA/ESA Hubble Space Telescope image shows an elliptical galaxy called NGC 2865. It lies just over 100 million light-years away from us in the constellation of Hydra — The Sea Serpent — and was discovered in 1835 by astronomer John Herschel. Elliptical galaxies are usually filled with old, dying stars. NGC 2865, however, is relatively youthful and dynamic, with a rapidly rotating disc full of young stars and metal-rich gas. For an elliptical galaxy it contains an unusually high number of young stars — suggesting that a galaxy-wide starburst took place about one billion years ago. The starburst itself was induced by a merger between a spiral galaxy, similar to our galaxy, the Milky Way, and an elliptical galaxy some three times more massive — the progenitor galaxy of NGC 2865. The new gas from the spiral galaxy revitalised the dying population of old stars in the elliptical galaxy, and several new generations of stars were born. The faint halo surrounding the galaxy, visible in this image, is also a result of this merger. It consists of cold gas that was ripped away from the spiral galaxy during the merging process. The gas now forms an almost closed shell around its host galaxy.